Shadows are formed when light cannot pass through an object. As light moves in a straight line, shadows are the same shape as the object making the shadow. To demonstrate this you can make shadow puppets. Draw some shapes onto some cardboard, and cut them out. Attach the shape to a lollypop stick or straw. Decorate if you wish. 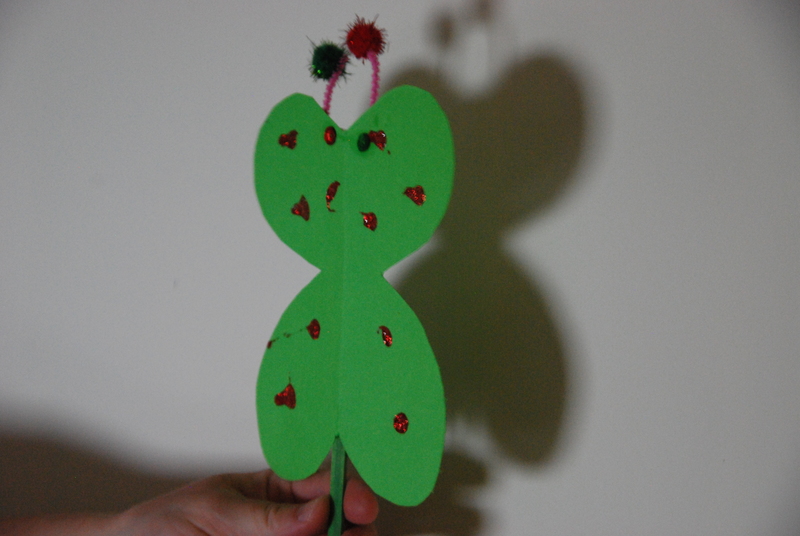 We made a butterfly and decorated with glitter, using pipe cleaners and little balls for the antennae. In a dark room hold the shadow puppet against a wall and shine the torch or a light at them. You should see the shadow on the wall. Try moving the puppet further from the wall to make the shadow bigger. Shadows are formed during an eclipse of the sun. An eclipse is when the moon passes between the sun and the Earth, casting a shadow over Earth. If the shadow blocks out all the light from the sun, it becomes dark during the day. For younger children you could also read ‘The Gruffalo’s Child’ where the mouse makes a shadow of himself to scare the Gruffalo. How about making some themed puppets like these Christmas shadow puppets. Can you make lots of small puppets and make up a story? Or act out a story you’ve read? « How tall is a tree? Shadow play is such a great cross curricular idea! From fostering puppetry and story telling to the scientific aspects you have shared! Love it! Thank you. The simple things are so much fun!